The Finnish metallers from Amorphis have recently released an album called 'The Beginning of Times', which they are touring to promote now. 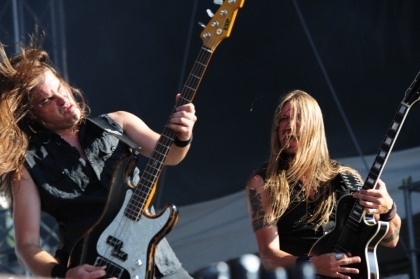 As they performed on the festival's main stage, on the last day of Tuska 2011 I had the opportunity for a short chat with Amorphis' bass player, Niclas Etelävuori. It was a really hectic day so it all ended up in a fast dialogue, but I am thankful to Niclar for his time. Me: How is it going with you guys? How's life for the band? Me: What does busy mean? Just concerts? recording anything? You just had a new release afterall..
NE: We only do shows now. We've been doing festivals for two months now almost every week. Me: How long is this planned to go on? Any outside Europe concerts? NE: In early June we played in Japan and Taiwan. Me: Taiwan, wow, how was the experience there? I guess they don't play many concerts..
NE: Not that much, true. It was great. And then we have a Finnish tour, we go to Russia, then an European tour then a couple of shows in America as well. Me: The current lineup is one of the longest in the life of the band. Do you think that made a difference on the latest albums, in the way that the new guys brought in new ideas? Or it would have been the same since the music is only composed by the old members? NE: I think it made a difference since when we write, somebody brings in an idea and we then all work on it. What's important by now is that we got used to each other and there's no longer a new guy who has to get into our way of working. Everybody is used to it and it's pretty easy to get things done. Me: I heard more symphonic stuff on the latest album, even female chorus, more advanced stuff than the old Amorphis to say so. Where did these ideas come from? NE: It kinda just happened because we played a lot together for the past 5 years. We've been on tour most of the time. So I guess maybe working together a lot it was easier to develop ideas like those. Me: How is it to play on stage next to Tomi when he spins his hair like that? Does it lead to many accidents? NE: Once his dread got stuck in my tuner, but nothing more than that. I usually play next to him so if it's really hot he's the only fan we got in the house. Me: What triggered the need for 'Magic and Mayhem' compilation of the older songs? NE: It was the year with the 20th anniversary of the band. But also when I joined the band it was the 10 years anniversary so two compilations came out back then, pretty much with the same songs as this one. We didn't have that much to do with it, it was rather the record company's idea. So now, instead of making a new compilation, we decided to take the same old songs that the crowd like and re record them, considering we have been with this lineup for quite a while now. It also gives an idea to the new fans who come and see us how we actually sound today when we perform such songs. Me: You had this 'Magic&Mayhem' reunion tour in Finland last year, with all the members from previous band lineups. How did it go? Any funny stories from it? NE: It was a nice experience. On some shows we had all the past members on stage at the same time. Especially since some of these members have left in peculiar circumstances and now everything got cleared out and we were all very happy about that. Actually I can mainly think about sad stories, not so much happy ones. For example at Tampere show, our ex singer, Pasi (Koskinen) he only came at the end of the set. And he was wearing some kind of fascist shirt which we didn't notice. But someone took a photo and we only saw when the photo was printed. Some Germans got really upset about it and blamed us. But he's no longer in the band, he's the former singer. Still, we had to give a lot of explanations. Such things should never happen. Me: Back to the current tour, its purpose is to promote the new album, 'The beginning of time'. NE: Exactly. The 'Magic&Mayhem' tour was only for the anniversary last year. So the playlist now is mainly based on the new stuff. NE: Especially for Romanian fans, we're actually playing two shows in November, one in Bucharest and one in Sibiu. So we're looking forward to see our fans there. We've been there a couple of times and they were both nice experiences. Me: Speaking of places where you've played before, any favorite ones? NE: There's so many good places to play, it's really hard to pick one. In Japan the audience was amazing. In South America the audience is amazing. Me: Is it much different from Europe? NE: Europe is amazing too. In some places it is a bit different, for example in Japan when the song part is changing people start to cheer. Maybe they get easily bored.